SCEC stands for Solidarietà che Cammina - Solidarity that walks. It is a complementary currency that is designed to start its life circulating in common with the official currency, the Euro. It is adapted to the Italian situation, where alternative currencies are looked upon as competition to the official one. So SCEC defines itself as a complementary currency. It circulates together with the official currency. SCEC is in the form of a discount chit denominated in Euro equivalents (in denominations of 0.50 Euro, 1, 2, 5, 10 and 50 Euro). It is distributed for free and acquires value only when used. Businesses and professionals agree to give a discount to buyers who pay (in part) with SCEC, usually around 20 %, but ranging mostly between 10 and 30 %. SCEC is putting first emphasis on actually supporting local production and commerce over imports from far away and world wide commerce by multinationals. The currency makes local exchanges more convenient for people who use the system, as they get a break by virtue of getting substantial discounts on the normal price. The SCEC, once issued, stay in circulation and can be spent at any business or professional that adheres to the program and states how much discount they are willing to give. In this way, SCEC is tax neutral - no tax is to be paid on it as it is merely a discount. Users of course, who are not subject to value added tax (VAT) when buying/selling second hand goods or exchanging favors and transactions in the social area can use SCEC to replace the official Euro currency in these direct exchanges. SCEC is a discount as far as the government is concerned, but it is a fledgling alternative currency as far as the users are concerned. It favors local commerce and as it gets more and more accepted, future uses might even include the payment of rates or (local) taxes. An electronic system to run side by side with the currently available paper currency is in the planning stage. This would work like any bank account. You can make transfers to other users of the system, and you can convert paper into electronic or electronic into paper, if so desired. Organizationally, SCEC is organized as a non profit "archipelago of several islands" which are the regional associations that are independent of each other, but agree to use the same kind of currency and to exchange information on who are the member businesses and professionals who accept SCEC as part payment for their goods or services. SCEC are issued periodically and equally to all participants in the system, in exchange for a voluntary contribution intended to defray the costs of printing and administration. Loans in SCEC to participating businesses are possible. 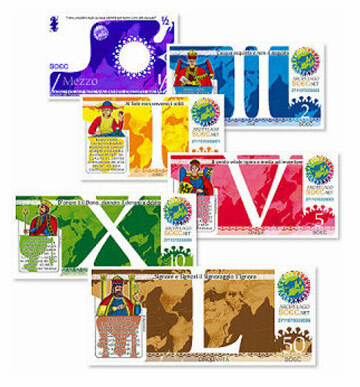 They are given as an advance on future distribution of the currency. Once someone has received a loan they will not receive any future SCEC distributed to others, until they are "caught up" and are once again eligible to receive the normal distributions. Anyone entering the system gets 100 SCEC to start trading. To get more, they have to either wait for another periodic distribution or have to start giving some kind of service for which they accept SCEC in payment. Feasta is making a determined effort to set up a system that allows participants to exchange goods and services with each other without anyone going into debt. Although our system will operate in parallel with the existing money system, it will not be a money system. The units used within our system will be units of measure analogous to kilos or metres. Like these measures, they will have no intrinsic value and will only operate as a counting device to give participants a way of comparing and expressing the value of the goods and services being exchanged and ensuring that some participants do not take more value from the system than they put in. Participants will not own the units in their account at any time.